Targeted advertising is moving beyond the desktop to Internet-connected devices around the world. The latest example comes from Renew, which has developed "smart" recycling bins that detect passing smartphones' Wi-Fi signals, and could soon be used to serve ads to specific individuals. 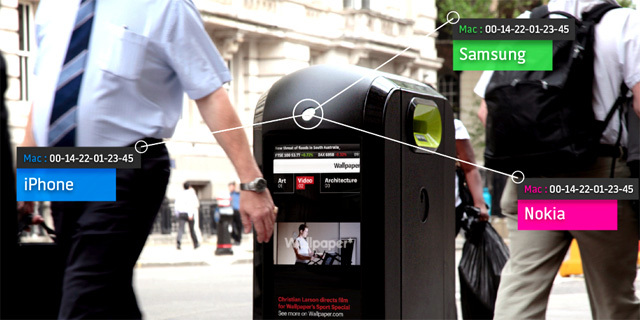 One hundred of the bins, which sported digital screens on which advertisers can buy space, were installed in London leading into the 2012 summer Olympics. Recently, Renew upgraded a dozen of them with devices that can detect the unique identification numbers of any passing smartphone that has Wi-Fi switched on. While the bins don't know the specific identity of the smartphone owner, they can determine the phone's manufacturer and model (i.e. an iPhone or a Samsung smartphone). They can also record the smartphone owner's route, showing how fast and in what direction he or she is walking. What's more, the bins can recognize whether the same smartphone owner passes by again the next day, or later that month. Right now, Renew says the bins are being used to measure smartphone market share among mobile handheld providers in London, but the opportunities for targeted advertising are clear. An advertiser could, for example, target only iPhone owners, or opt not to show the same ads to the same individuals. No doubt many people will be concerned that they are being tracked in this way. For peace of mind, then, Londoners can opt out of the tracking on the website of Presence Orb, which handles analytics for Renew. Watch the video, above, for more on the bins; then tell us what you think in the comments.